You are here: Home / Blogging & Writing / Wake Up America. 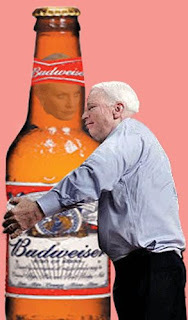 John McCain is Senator from a Pit of Corruption. This is the first of many posts that will be made over the next couple of months that highlight John McCain and what his interests and protection of interests vital to his family’s continuing wealth have done to Arizona. This article by Halbfinger in yesterday’s New York Times offers tantalizing details that require further investigation about financial holdings and interests of the McCain family. Family is an interesting term to use here, as it also has a more foreboding connotation illustrated to me by a friend of mine who was told by his Chicago-based “labor relations” father-in-law —whose son has a beer distributorship in Northern Indiana— “Ya don’t juss marry da girl, ya marry da Family.” McCain’s children and wife, THE McCAIN FAMILY either run and/or hold significant shares in the massive Cindy Hensley McCain owned beer distributorship in Arizona. I live in Arizona. October 2nd I will be into my third decade lived in Arizona under the regal rule of the very small number of families that control almost every aspect “plantation Arizona.” My life has been impacted by the lack of concern these families, such as the McCain family, have for the people of the state. John McCain has never lived in this state, he has flown over the lives of the little people in strata above the everyday lives his entire time he has been associated with the richest women the state. He was arm candy for little Cindy Lou. But Arizona ranks low in taxes on beer. Close to 20% lower than the national average on alcohol taxes. Hmmmmm. What people are side-stepping is what the beer distributorship, the Keating Five, and Marley connections imply. Organized crime. Perhaps mobster perhaps not…. organized crime comes in all sorts of white collars in Arizona. Wake up America! You don’t want anything to do with any successful politician from this corrupt state.